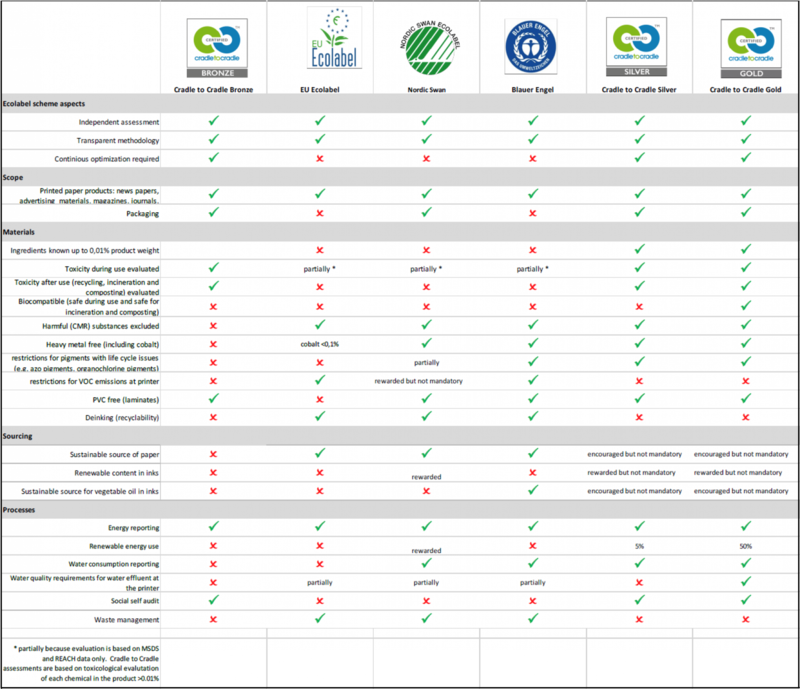 This comparison covers environmental labels used to evaluate printing components like inks as well as printed matter. These include Cradle to Cradle Certified™, Blue Angel, Nordic Ecolabel /Nordic Swan, EU Ecolabel, Swiss and draft German Ordinances on food contact and composting standards (OK Compost, DIN CERTCO). Other standards like REACH and guidelines provided by industry organizations like CEPI, EuPIA and INGEDE were taken into consideration but not evaluated per se, as these are not considered to be certification labels or printing-specific regulations. The table below provides a brief summary of these conclusions. Companies seeking to claim biocompatibility of their printing products could use specific sections of labels and regulatory ordinances to start on the way to healthy printing, but the C2C Gold and Platinum levels are still the ‘gold standard’.